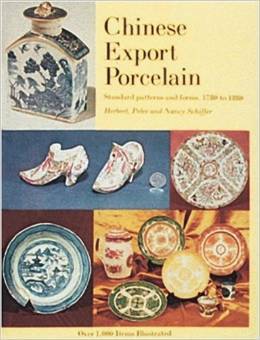 Chinese Export Porcelain, Standard Patterns and Forms by Herbert F Schiffer contains over 1000 items illustrated in black and white and 49 color plates. This book tells the story of the exciting and dangerous "China Trade." The principal purpose of this book is to show and discuss the many forms and variations that have made this field so fascinating. The text is simple and factual and explodes many cherished myths and fantasies about these wares. The pictures and captions tell the story. Chinese porcelain of the period 1820 through 1920 has, to date, been the province of a minority of academic authors and a few adventurous dealers and collectors. This misunderstood but fascinating field of study is now brought within the reach of the average collector. 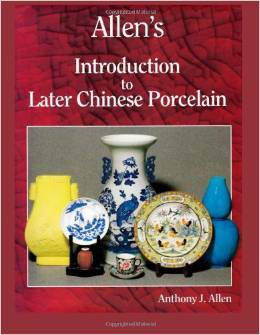 Written with the interests of novice collectors and dealers in mind, superbly illustrated in color throughout, each of the introductory chapters conclude with suggestions for further reading, and thus provide a fast but solid grounding for the primary focus of the book: dating of later Chinese porcelains. 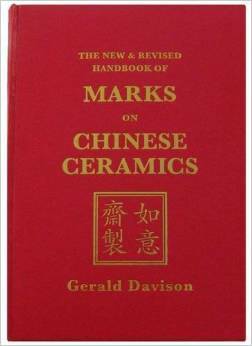 This book discusses marks, reign marks, foot-rims, glazes, bubbles, flaws and imperfections, and other indications of a date of manufacture, including the contentious subjects of hollow line and the reversed S; illustrating in close-up images many of the features used by the author to substantiate his assertions. Unashamedly provocative, Allen concludes with chapters on those subjects most earlier writers treated as taboo, including Modern Fakes and their detection, buying trips in Asia, and recommendations for investment. Building on the gradual success of the unique small format 'Guide' (450 marks) published in 1987 which was reprinted twice, and then the much acclaimed and more comprehensive 'Handbook' (1800 marks) published in 1994, this NEW and EXPANDED publication now contains TWICE the content with approaching 3,400 marks spread over 310 pages. Almost 10 years in the making it is the only reference work in any language to deal so exhaustively with the entire range of these very diverse marks. This time, the almost 3,400 individual marks are beautifully reproduced in colour and still compiled in sections and groupings to make recognition of such unfamiliar shapes as easy as possible. All of the marks are translated into English together with the pinyin Romanisation. 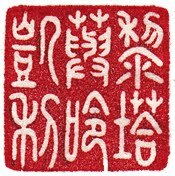 The range of marks includes not only those in the regular kaishu script but also some 500 marks redrawn in the classical zhuanshu seal script form together with a range of pictorial symbols. Finally the very detailed 70 page Directory section then provides a wide range of historical, dating, geographical and mythological information, where available, for each mark. Inscriptions and marks of varying types appeared on Chinese pottery and porcelain with increasing frequency from the Tang Dynasty (618 - 906 CE) through to the Republic in the early years of the 20th century. From imperial marks to the many "hall" and auspicious marks used by scholars, collectors, potters and artists this is the essential book for all professional buyers, collectors and antique and art dealers with an interest in Chinese ceramics. Written in a way that will appeal to the beginner as well as the experienced professional, the introduction contains color illustrations of a varied range of objects together with their marks.